Transformation of the Day: Rozina lost 114 pounds. Being overweight caused her a lot of problems and pain over the years. Seeing a friend’s success moved her to take action and start her 4 year journey. 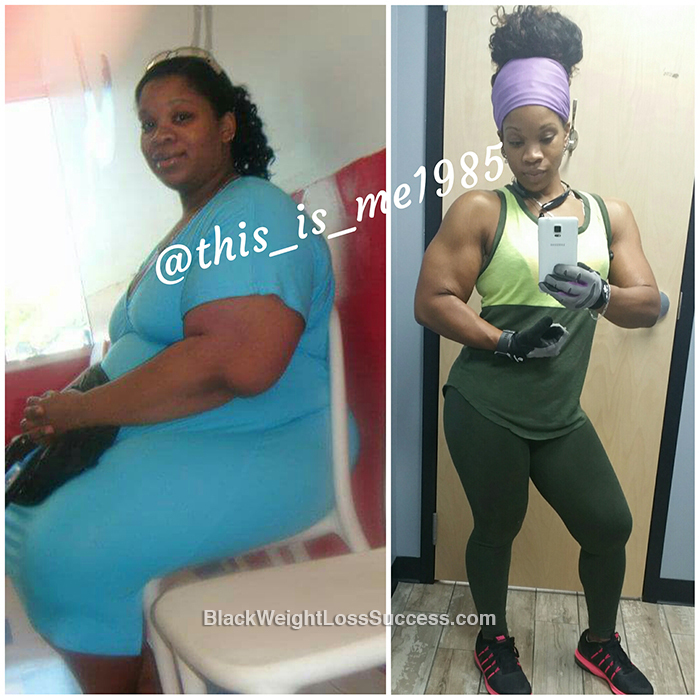 She changed her eating habits and put in a lot of work in the gym. Check out her story. I was tired of being overweight. I was tired of sticking my finger down my throat and trying to starve. I felt like the reason I was cheated on and why all my failed relationships was my size. Growing up, I shied away from making friends in school because I felt like nobody would want to be friends with a fat girl (unless they were scared to get beat up by them lol). I grew up miserable and as a loner. Time went on and I tried going to the gym but gave up cause it was to much work. I eventually had kids and I slowly started losing weight, but eventually gave up. Then, I saw a friend who had been almost twice my weight who was losing weight. I knew that if she did it, then I could too. So, I followed a diet plan that my friend’s nutritionist gave her and saw some progress. When I hit a plateau, I reached out to my doctor about the weight loss surgery. He told me that I had no medical issues, I was just overweight. I took his words as him calling me fat. He also told me go to Weight Watchers and I said to myself, “I’m not going to sit in the meetings like I’m an addict.” In response, I did what I needed to do. I got in the gym, started taking exercise classes and that was it from there. When I was living with my mom, my grandmother lived next door. They would fry a lot of the food we ate, use butter, gravy, etc. That’s what I ate. My grandmother and my father were from down south. With southern people everything is fried, buttered and smothered.. lol. My father passed away in 2015 from cancer. Once I moved from my mom’s house in 2013, I was able to cook the way I wanted to. Everything was baked or put in a slow cooker. I cut out pork and beef. I ate chicken, fish and turkey. I also switched to whole grain food and started eating more veggies and some fruits. I left the pasta and bread alone. I just really began to eat smaller portions as well. As I said before, I followed a diet that a friend of mine received from her dietitian. Once I found a gym with child care there was no excuse. I went from working out 3 days to 6 and 7 days a week and sometimes 2 times a day. I worked out anywhere from 2 to 4 hours a day. I do Zumba class for an hour on Monday, Thursday and Saturday. Before my weight training workouts, I do 15 to 20 minutes on the stair master at level 8 or run on the treadmill with the speed at 5 or an incline for 15 and 30 minutes (speed at 3). When I lift weights, I do 3 to 4 exercises per body. On Monday, it’s legs and calfs. Tuesday is chest and biceps. Wednesday is back and triceps. Thursday is shoulders and abs. Friday is just pretty much my cardio day, so I do 30 minutes on the stair master at level 6 and then 20-30 minutes on the treadmill. I also take a yoga class on Friday for an hour. On Saturday, I take Aumba and then go lift upper body, because my legs will be sore from dancing. Sunday is sometimes my rest day. On the days that I don’t go to the gym, I use an awesome app called 8fit that gives me workouts I can do without gym equipment in the park or at home. My starting weight was 285 pounds and my current weight is 171 pounds. My height is 5’5″. No surgery. I started in the Fall of 2012, so it’s been 4 years. It’s a very slow journey. That’s why people become so discouraged, because they want fast results and end up quitting. I’ve given up many times, but found myself going back and starting again. I told myself that I had to get this right eventually. I tried to go the easy route and get surgery, but that didn’t work. So I had two options; Give up, stay fat and look in the mirror unhappy with what I’m looking at or keep going and just trust the process. I chose to trust the process. Instead of looking at how far u have to go, you have to look at how far you have gotten. Whether it’s 5 pounds or 100 pounds, you have to see that it is not where you use to be and that you are getting somewhere. Great job! Just one thing, I did Weight Watchers and lost (currently) 90 pounds. Yes, I went to the meetings and YES most overweight people are food addicts (though we may not want to admit it). I encourage women to do whatever works for them. I just wanted to say that because I don’t want anyone to look at this and feel as if going to Weight Watchers to get help loosing weight makes them “less than.” Do what works for YOU. So inspiring! I pray for motivation to stick to my workout.